Thanks to your support, we welcomed 22 new boys to Shelter this month! 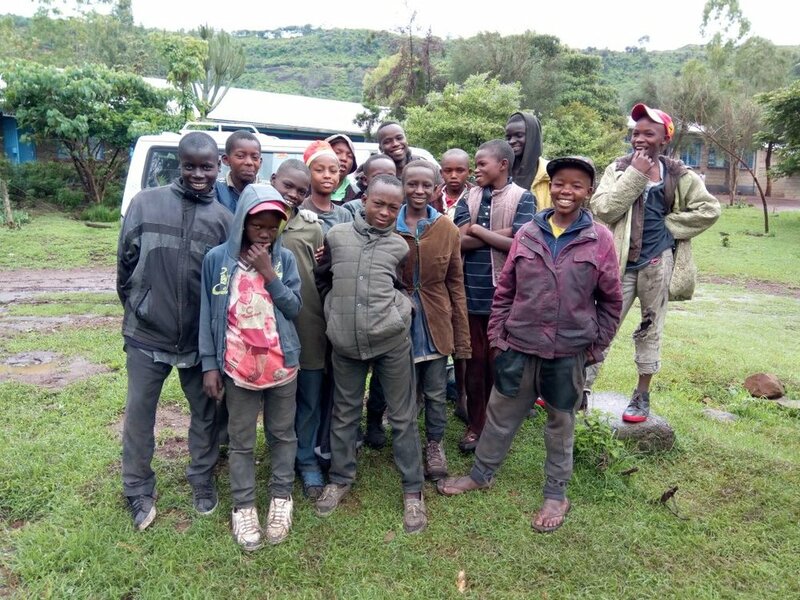 Our 2019 rescue group is made up of boys from the age of 8-17, though the majority of them are between 12-14. They come from Naivasha, Nakuru, and Mai Mahiu, and their time on the street ranges from a few weeks to a few years. Each of their stories is unique and our social work team has been working closely with them to learn about their background and what drove them to the streets. The boys are busy adjusting to their new routine and responsibilities, and for some, it can be a very difficult transition. But we are already seeing a lot of progress and motivation to return to their families/communities, and continue their education. We are so excited about what's ahead for each of them, and we look forward to updating you about their journey. Kelvin is the youngest of our new boys, at just 8 years old. He is very bright, and he loves to dance and play practical jokes on the bigger boys. Kelvin's mother recently remarried, and due to a difficult relationship with his new stepfather and discipline issues at school, he ran to the streets of Naivasha. We are confident that after he and his family complete the rehabilitation program, Kelvin will be able to return home and continue his education. The new boys spend their first 3 days after rescue at an orientation camp. 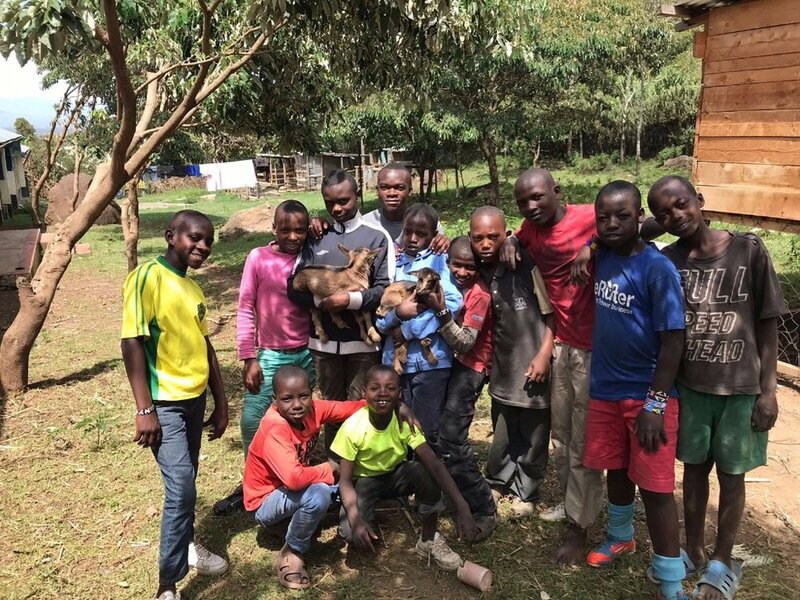 The boys and staff head to beautiful Lake Naivasha, where we educate them on life at Shelter and many other topics related to drugs, trauma, and family reunification. In line with our mission that "the very best place for a child is in a family," our social work team has been learning a lot about the value of reintegrating as soon as the child and family are ready, rather than doing the bulk of our reintegrations at the end of the year. In 2019, we'll be reintegrating boys throughout the year, as we assess that they and their families are ready. This should allow us to serve even more boys throughout the year, and we are so excited about all of the families who will be reunited in the months ahead. Would you join us in helping these children get off the streets and back with their families? Your monthly donation will go a long way in helping us change the life of the more than 300,000 children living on the streets of Kenya. During the month of February, our social workers on out of the streets every day, looking for boys who are ready to change their lives. This year, we are hoping to rescue 20 boys from the streets, rehabilitate them, and help them to reconnect with their families and return to school. These boys go through unspeakable suffering on the streets. Just last week, more than 50 boys were arrested by the police and dumped in a forest in a neighboring county. According to local media, the police told these boys they were taking them to school, alone to be left alone and afraid in the middle of the night. Please pray that our social workers will be able to build good relationships with these boys, and with the local authorities, to ensure that these boys will have opportunity to begin a new life next month. Research proves that children do best in a family. In fact, 8 out of 10 children in orphanages around the world have a living parent. Building relationships with boys on the streets is the first step in our process. After weeks of getting to know a boy on the streets, our social workers will bring him to Naivasha Children's Shelter where he will receive medical care, nutritious meals, new clothing, and a loving environment. Our qualified and loving staff will provide him with the counseling, skills training, drug rehabilitation, academic work and spiritual care he needs to be reintegrated with his family and community. Through a long-term relationship, our social workers do the difficult work of helping equip families to care for and love their children. After 9 months of rehabilitation, and one year of carpentry training, Rodgers finally has his first job! Rodgers lived on the streets of Nairobi for five years before moving to the Shelter. His mother passed away when he was a toddler, and his grandmother struggled to raise him. Eventually, he ran away. But thanks to donors like you, Rodgers was able to change his life. Shelter social workers helped him to leave the streets and learn the carpentry trade so that he can now support himself—and perhaps, someday, a family. Happy Holidays from Naivasha Children's Shelter! Father Christmas visited the Shelter early this year! Our wish this Christmas: a high school education for Paul and Ken. Last month, we shared with you about how well two of the Shelter boys recently did on their primary school exams. This month we learned that both of these boys were accepted into good high schools! Paul even did well enough to make it into a national school (a huge honor)! Both of these boys come from very difficult backgrounds. Paul was rescued by the Shelter in 2011 after he was found begging for food and not attending school. Paul's mother is disabled, and unable to walk or to use her hands. The family survives on the kindness of neighbors. Ken was rescued by Shelter in 2010 when he was found wandering the streets alone in town after his father, a security guard, was killed on the job. Both of these boys are a part of the Shelter family, and we are committed to giving them a bright future, with your help. We are trying to raise $1,700 to send both of these boys to boarding school next year. Would you be willing to help gift these boys with the best Christmas present they could imagine--a chance at a good high school education? Would you be willing to give generously to help give these boys the opportunity to attend high school? This month, 16 boys are being reunited with their families. Joram was referred to Naivasha Children’s Shelter by government after dropping out of school in 2016. Living on the streets, Joram was surviving by begging and doing casual labor. After being counseled by his uncle, Joram agreed to undertake a vocational course in carpentry at the Shelter. Now he has completed the carpentry course and national exam, and will be placed in a job in January. Joram’s grandmother was happy to receive him and thanked the Shelter for reaching out to him and changing his life. 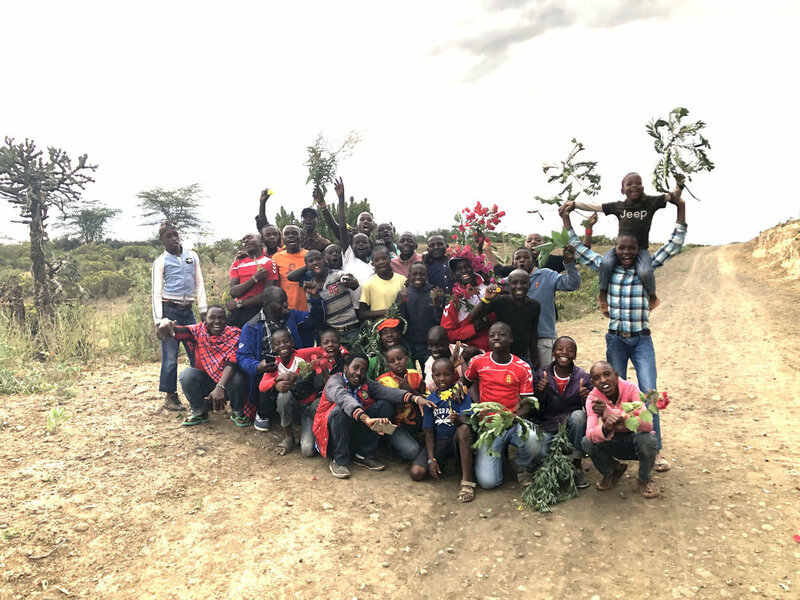 When the boys at Shelter heard how well Kennedy and Paul had done on their national exams, they ran 2km to town to congratulate the boys, grabbing flowers and tree branches along the way! To our friends in the U.S.: Happy Thanksgiving! Here at Naivasha Children's Shelter, we have a lot to be thankful for! With your help, this year the Shelter has provided residential care for 42 boys. We rescued 20 boys from the street in April, and trained 10 boys in carpentry and joinery. We supported 29 boys living with their families with school fees, and are preparing to reunite 16 boys with their families next month! We can't do this work without your help. This holiday season, would you consider partnering with us with monthly donation of $5 or $10 a month? Additionally, two of the boys who live at the Shelter recently took their KCPE test. The test covers everything they have learned from kindergarten to eighth grade and is important because it determines which high school they will attend. This week, we got word that Kennedy and Paul both did very well on the test and Paul was even the top scorer in all of Naivasha! When the other boys heard the news, they dropped everything they were doing to celebrate these two boys. They ran 2 kilometers to the main road, grabbing flowers and tree branches along the way, to meet Paul, who was arriving from town. We are all so proud of Kennedy and Paul! Please join us in celebrating their great achievement! Joram, a student in our carpentry program, shares a meal with his father after a parents' meeting at Shelter. In December, Joram will return home to live with his family and begin working at a local workshop. He will be able to support himself and help his family. This month, 19 parents participated in our parents’ meeting. The meeting gave parents a chance to understand their children’s life at the Shelter, and to prepare the parents for reintegration next month. "When my child began staying on the streets with his new friends, I tried the best I could to help, but I wasn't able. Thank you for coming beside me and doing what I could not do! I know now my son will be able to make it in life," one parent told Shelter staff during the meeting. It truly takes a whole community to raise a child, and we are proud to come beside these parents in their time of need. #GivingTuesday is right around the corner. During this season of gratitude, would you consider partnering with us to give children living on the streets a new chance at life? A monthly donation of $5 or $10 will go a long way in helping us pay our staff, keep the lights on, empower families to care for their children an send boys to school. Mark your calendar for November 27, and plan to become a part of the Shelter family! Our carpentry department is committed to equipping young men from the streets with the skills and training they need to succeed in life and become self-supporting. Two years ago, Jeff was finishing eighth grade when his mother remarried. His step-father was unkind to him, insulting him and abusing him until, finally, Jeff ran to the streets. Jeff spent a year living on the streets--begging for food, and being abused by police and older boys. He lost hope. Then, in April 2017, something miraculous happened. Jeff met a Shelter social worker who told him that a different life was possible. Jeff was rescued and brought to Naivasha Children's Shelter, where he was given clothing, food and a bed to sleep in. He was surrounded by loving and supporting adults who helped him recover from his time on the streets. Jeff decided to pursue a carpentry course, and spent a year studying carpentry and joinery at the Shelter. "My friends who remained on the streets, they are really suffering," Jeff said. "Some of them are in jail now. That would have been me without Shelter." Jeff is now doing an attachment at a local carpentry shop, and the owner said he is one of his best workers. "The Shelter carpentry course has given me new hope for life. I know I will be able to support myself, and my future is looking good. I want to thank all of the people who have given to Shelter to give me this opportunity--may God bless you." 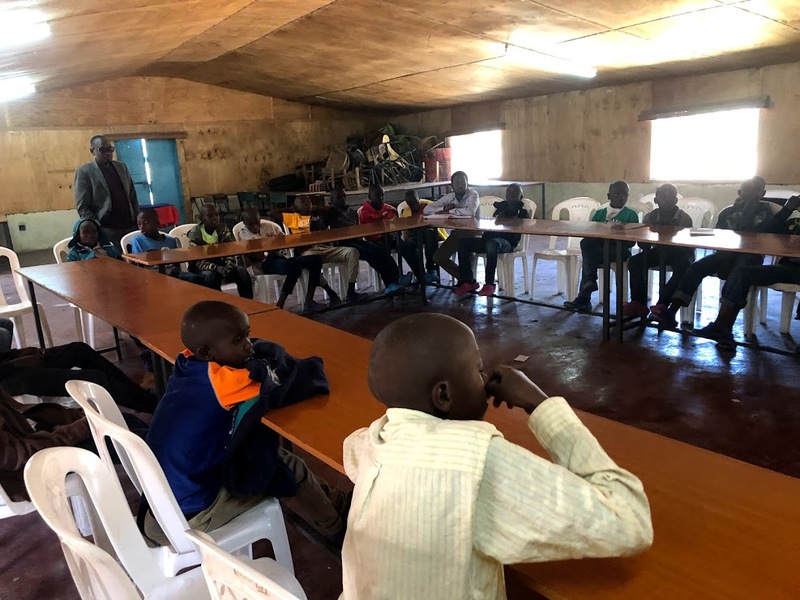 To help us rescue more boys from the streets of Kenya and give them a second chance in life, please consider partnering with us with a one-time or monthly donation. Peter was recently elected as head boy of the Shelter. Peter, who was rescued from the streets in March, said that the job is a big responsibility. "Being head boy means that I ensure all the boys are doing their responsibilities. I also must be fair to all the boys in helping settle disputes. I must treat all the boys equally even if one of them is my friend. If there is a problem too big for me to handle, I will get help from the teachers." Peter lived on the streets for seven years before being rescued by Naivasha Children's Shelter. He's now pursuing a carpentry course to provide for himself and his family. We're so thankful to have him as part of the Shelter family! Nine new boys began our carpentry program this month. 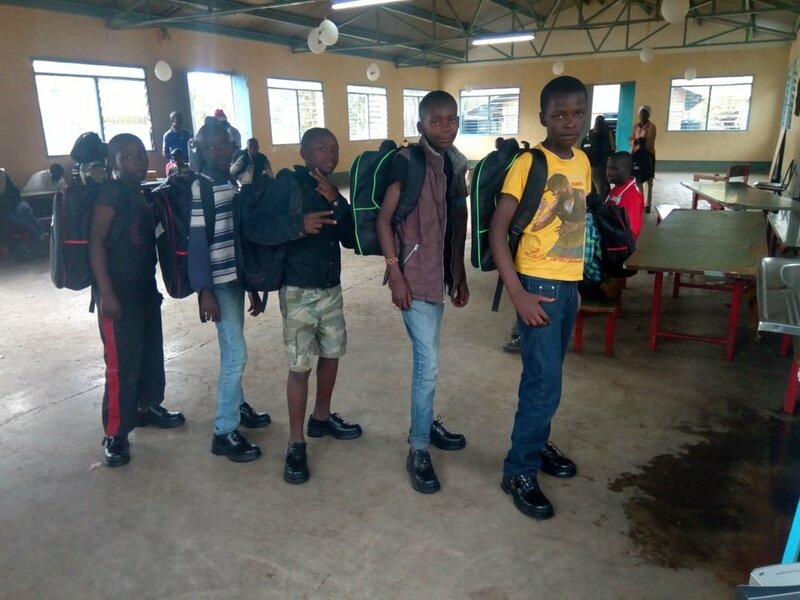 These boys have completed our rehabilitation program and will study carpentry and joinery for one year before doing a three-month attachment and then being reunited with their family and placed in a job in a local carpentry shop. In May, we shared with you about Samson. Samson was rescued from the streets in March, after running away from home when he lost his father's bicycle. A couple weeks ago, one of our social workers, Isaiah, traveled with Samson to visit his family. The following is a report from Isaiah. "On arrival to the home, we were welcomed with opened arms by a group of women who were having a church fellowship at their home. The entire village broke out in celebration after the good news emerged that Samson is back. Others broke into tears of joy. The boy was reported to police as a lost child. His case was also reported on a local radio station. His parents, who are devout Christians, were joined by the church members in the rescue mission. They traveled through western Kenyan’s towns such as Bungoma, Kakamega and Eldoret in search of the child. However, their efforts were futile. Eventually, they gave up and left the rest to God. Samson's father works in Limuru and the mother stays at home. Upon arrival, we had thanksgiving prayers with the family members and the neighbors. Since the father was away, I decided to have a conference call with him to update and inquire more information about the child. He was thankful to Shelter for rescuing his beloved son. ‘Sam is my favorite son and I love him so much, he only took my bicycle but God enabled me to purchase a motorcycle instead. I have even forgiven him long time ago,' he shared. After getting that response from him, I knew that all was well. The boy is now accepted back at home. As we continued chatting, I explained to them more about the Shelter and that the boy should finish up the rehabilitation program before being reunited with his family. The following day, we visited Fig Tree Primary School where the child used to study. Both the teachers and the pupils were very happy that he is back." Kelvin harvests tomatoes from one of our greenhouses. This year, our produce has been exceptionally good--we have been able to grow enough vegetables for the boys, and even had surplus to sell in the market! Growing our own food helps move us toward sustainability, and also helps teach responsibility and stewardship to the boys! The Shelter partnered with Ndonyo Healthcare Hospital in Naivasha to conduct a medical camp for the 41 boys currently living at the Shelter. Each boy was examined by a physician, and given advice on how to remain healthy. This service is vital to the future health of the boys, many who suffered from ill health while living on the streets. Samson, age 15, was rescued from the streets of Kenya last month. Samson hopes to return to his family, finish school and become a soldier one day. It was a typical Sunday afternoon. Samson borrowed his father's bicycle, and headed to his family's small plot of land, where he was spent the next several hours planting corn. When he finished, Samson returned to the edge of the field, where he had left the bicycle leaning against a fence. But the bicycle was gone. Exhausted, and afraid of punishment, Samson made a quick decision to run. He spent the next two days walking to the next town. When he arrived, he convinced a bus driver to take him further. He soon arrived in Naivasha, almost 200 miles from his home, where he fell in with a group of street boys. They spent their days collecting plastics to sell and running from the police. For the first time, Samson slept on the streets. He was chased and beaten by police and shop owners. He never got enough to eat--most nights he slept hungry. And because he arrived during rainy season, the ground was always wet and cold. There were nights he could't sleep at all. But this was his new life--after running away, how could he cope with the shame of returning? Then, one day, he met a social worker from Naivasha Children's Shelter. Isaiah told him about Shelter, where he could sleep in a warm bed, and have enough food. Shelter staff would help him return home, ask forgiveness from his father and enroll in school again. Last month, Samson spent his last night on the street. When he arrived at Shelter, he was overwhelmed with happiness. "Shelter is a good place. Here, I never sleep hungry, and no one beats me." Later this year, Samson hopes to return home, re-enroll in seventh grade and work hard to be able to replace his father's bicycle. "I thank God for the Shelter for coming into my rescue. I promise to take the chance seriously for the sake of my future." Hundreds of thousands of boys are still sleeping on the streets tonight. If you would like to help boys like Samson get off the streets and have a second chance at life, would you consider a monthly donation to Friends of Naivasha Children's Shelter? Every little bit helps. Last month, 20 boys were rescued from the streets of Kenya. Charles was recently elected by his classmates as school's president. Charles came to the Shelter when he was only three years old. He was rescued by neighbors and brought to the Shelter after he was abandoned by his mother. For years, Charles struggled with his studies. At age 12, he still struggled with reading and writing. He was a shy boy, and had a difficult time making friends outside the Shelter. But recently, Charles has made huge improvements in his studies and has proved himself a leader among his peers. This year, Charles, with the help of some other Shelter boys, ran a campaign to become president of his elementary school. In Kenyan schools, students in fourth through eighth grade are allowed to vote on a school president. On voting day, Charles, who is only in sixth grade, was overwhelmingly elected as the school's president! According to Charles, some of his roles include ensuring that discipline is maintained, ensuring that all pupils participate in cleaning the school and reporting any concerns raised by pupils to the head teacher. Charles credits his teachers at Shelter with helping prepare him to be a leader. 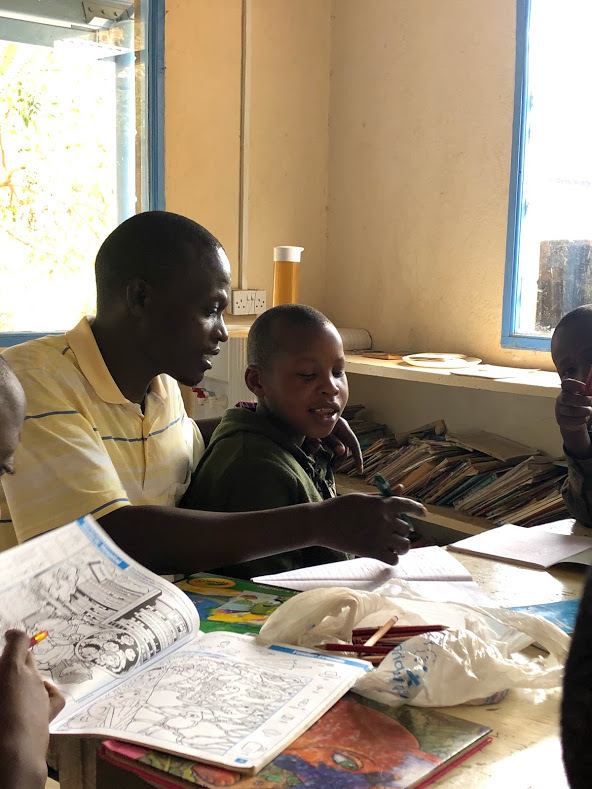 "My teachers at Shelter are very supportive and have taught me how to be disciplined, honest and hardworking, which are qualities of a good leader," Charles said. Because of your support, Naivasha Children's Shelter is rescuing boys and building leaders. Donate now to help us raise up leaders like Charles from the streets of Kenya. 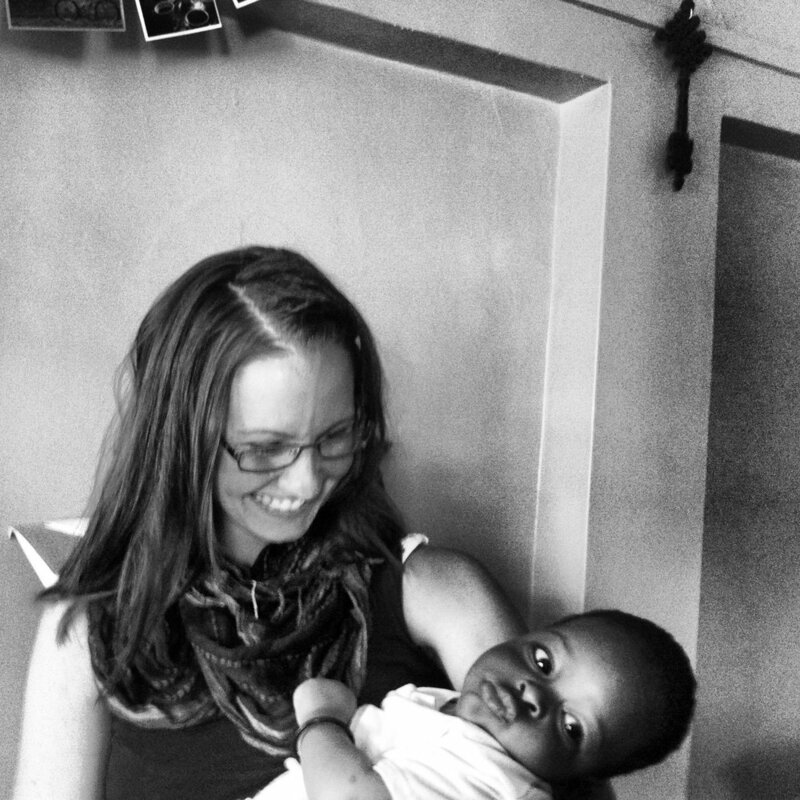 Naivasha Children's Shelter Co-director Kristen Lowry with Bahati at 4 months old. I met Bahati when he was only a few months old. I knew his oldest brother, Cortez, who was living on the streets. Cortez, along with a few other boys, lived on my street, and slept under an old truck. They often came to my apartment and cooked meals and watched cartoons. They helped me learn Swahili, and laughed at my inability to cook ugali, the local staple food. Over the course of my friendship with Cortez, I got to know his mother, as well. Mama Cortez really struggled. She had three boys, and she lived in one of the more dangerous slums in Nairobi. She did her best to care for her boys. She did laundry for other women in the slum. She built beautiful, intricate model boats to sell. She loved her children, and her children loved her. Two years ago, Bahati's mother and father both passed away suddenly. Naivasha Children's Shelter was able to rescue one of his older brothers, Martin. At the age of 13, Martin began attending school for the first time, and thrived. But Bahati was left in the care of his aunt, and then, later, a family friend. Recently we learned that Bahati was living in a one-room shack with a dozen other children. There was rarely enough food to eat. He would accompany his guardian to the streets to beg. Bahati is five years old. Until last month. Last month, Shelter social workers were able to rescue Bahati and bring him back to the Shelter. He was reunited with his brother, Martin, and will begin attending school this year. The situation still isn't ideal. There is no suitable family with whom to reunite these boys. But now, they have each other, and they have a safe place where they are loved and cared for. The social workers tell me that Martin is beside himself with joy. He is carrying his brother on his back, introducing him to all his friends and telling him about the school he will soon begin attending. If you've ever donated to Naivasha Children's Shelter, you are a part of this story. You helped reunite these brothers, and send them to school. You helped give them new life. Bahati and Martin, together at the Shelter. Joseph with his grandmother, uncle and cousins at his home in rural Kenya. If we had to answer that same question, “What are you thankful for?” our answer would be YOU. We are so thankful for your decision to partner with us to find and rescue boys like Joseph. Joseph came to Shelter in 2013. He was drawn to the streets after the death of his father because of extreme poverty at home, and had been out of formal schooling for quite some time when he arrived at Shelter. Joseph could barely read or write when he came. Daniel, the Shelter administrator, spent countless hours working with him on his reading and writing skills. Now Joseph is one of the brightest students in his class at school. He reads and writes exceptionally well, and he credits Daniel and the staff at Shelter for the radical change. In December, after 4 years at Shelter, Joseph was reunited with his family. Thanks to the continued support of Shelter, Joseph enrolled in fifth grade in a school close to his home this month. Now, he lives with his uncle and grandmother. 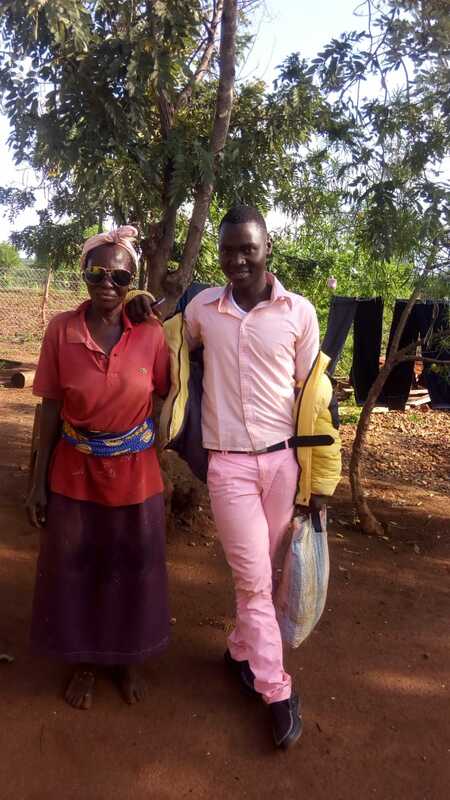 His grandmother is partially blind, but the bond between her and Joseph is evident. When social workers went to visit him in January, Joseph proudly described every detail and confirmed that he was doing great and studying hard. We know there are great things in Joseph’s future. Joseph is one of our many success stories last year, but the sad reality is that there are still hundreds of thousands of boys who will go to sleep on the streets of Kenya tonight. At Naivasha Children’s Shelter, we will continue to work towards our goal of no child being forced to live on the streets. We’ve already identified and begun relationships with boys we hope to rescue and help start a new life in a few short months. Your generous donations make this work possible. In fact, in 2017 alone we were able to provide more than 40 children with food, shelter, and education as they transitioned off the streets. We trained six young men in carpentry and they are now employed. Best of all, 19 boys have been reunited with their families because of you! Thank you just doesn’t seem like enough, but please accept our sincere gratitude for partnering with us as we work to rescue, restore and reunite with family boys like Joseph. Could you add one more person to your holiday list? David is 12 years old. Last year, he ran away from home because his mother could no longer afford to send him to school. In March, Shelter social workers rescued him from the streets and brought him to Naivahsa Children's Shelter. His only wish this Christmas is to go back home and return to school. With your help, we can make his wish come true! David will need new school shoes, a uniform and school supplies. And to make sure he stays in school, his mother will need help starting a small business. Would you consider donating to Naivasha Children's Shelter this #GivingTuesday? Your gift will help David, and 15 other boys at the Shelter have everything they need to return to school in January. Since we began our program of rescuing, rehabilitating and restoring boys in 2015, we've been able to change the course of so many boys' lives! With your help, we've rescued 86 boys from a life of desperation on the streets. Thank you for your investment in these children, their families, and their communities! Samuel made it to university! Samuel reported for university last month. The Shelter boys and staff, and especially Samuel, would like to extend a huge "thank you" for all those who donated to make Samuel's dream a reality! At age 9, Samuel and his younger brother David were living on the streets with their mentally ill mother. They were rescued by Naivasha Children's Shelter. 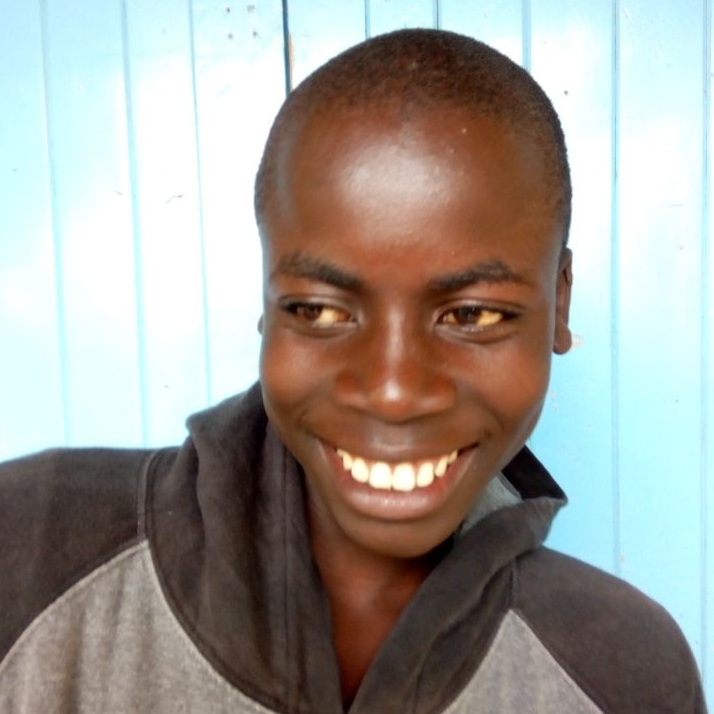 With Shelter support, Samuel was able to attend primary school and make it through high school. Unfortunately, Samuel's mother passed away last year, leaving him an orphan, and with no means to pay for schooling. Samuel was admitted at Masinde Muliro University to study for his Bachelor of Science in Physics. With your help, we raised enough money to send Samuel to school! Samuel is now one of three young men the Shelter is supporting in university. Help us rescue more children. Your gift can change a boy's life--every dollar helps. In March 2017, Janell Simmons spent almost a month volunteering at the Naivasha Children’s Shelter. She helped train staff in counseling and social work, and participated in our annual rescue. What I love about it is pretty obvious. There’s no way to watch it without smiling. And trust me, those nightly dance parties were just as fun as they look. 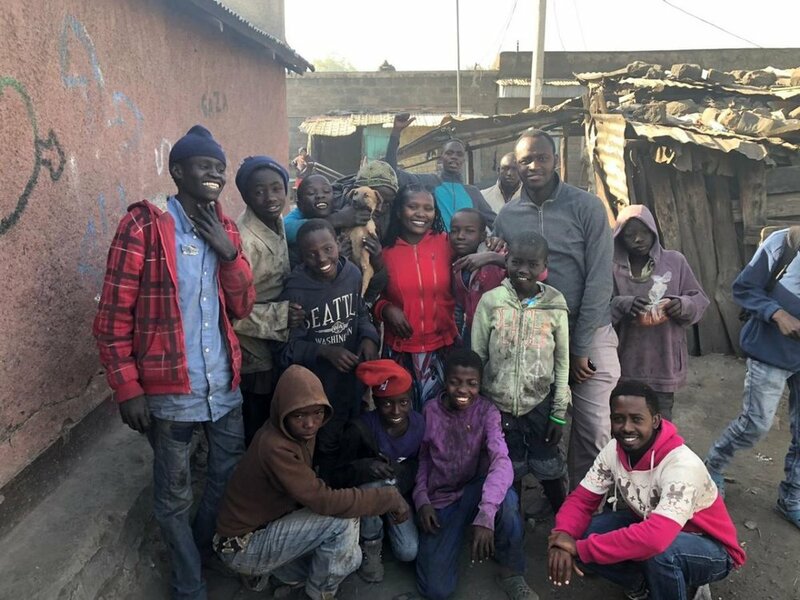 But what you may not know at first glance is that many of these boys (including sweet Kamau, the clear star) woke up on the street that morning. This was the night of the big rescue in Naivasha and Nakuru, and less than an hour after this video was taken, Kamau and the other new boys went to sleep in a safe, clean bed, for the first time in who knows how long. It’s so incredible to me that just hours removed from the atrocities they experienced on the street, the signs of hope and joy are already creeping in. The first days after the rescue are filled with a lot of orientation. The staff meets with the boys each morning to talk through things like chores, meals, showers, bedtime, etc. But what I love is that throughout those meetings (and all day, every day), the staff takes every opportunity to tell them how important, valued, and loved they are. Even discussions around things like hygiene lead to reminders about identity and why it is important to respect ourselves and our bodies. For these “forgotten” children, who, if they were acknowledged on the street at all, it was to harass or abuse them, this message is powerful. They begin to thrive almost immediately. Even in those first few weeks, where the transition is still pretty tough, there is a pride and a hope that emerges as they are treated like the precious souls that they are instead of the “nuisances” the world around them has tried to convince them they are. Unfortuantely, they don’t always stay at the Shelter. Sometimes they run back to the “comfort” of life on the streets. But it doesn’t change the hope that has been set in motion. This is my friend Jomo. He is such a ham and one of the funniest kids I know. He was the first boy I met on campus – the only one brave enough to join the staff as they gave me the tour on my first day. He was always asking me to video him doing something silly, and we spent a lot of time laughing together. One of my last days at the shelter, he showed me (as promised) how to milk the goats on campus. That is one of his responsibilities and every afternoon when he comes in from school, he wrangles the goats (no easy task), gets them in their pens, and gets the job done. I was not a great student, but he patiently waited while I squeezed out a few ounces before taking over and finishing up in about 30 seconds. Thanks to our slightly distracted photographer, Martin (the selfie king), I have definitive proof that I did, in fact, milk a goat, albeit very poorly. Over the course of my time there, our conversations moved from pretty silly to pretty profound. One day we took a walk and Jomo started talking about his time at the shelter. He’s lived there a few years. He said that when he arrived, he could barely even read or write, which was surprising to me, because he was constantly reading and writing very well (in both Swahili and English) with me. When I asked him how he learned so quickly, he said, “Mr. Daniel (the shelter administrator) taught me everything.” He also told me that he anticipates being able to reunite with his family later this year because of the work that he and his family have done together with the social workers. He’s actually spending time with them now on a school break. I know he is really proud and excited to be going home soon. He is so smart and talented and the future ahead of him is so bright I can hardly stand it. I can’t wait to see what he does in the coming years. Where would Jomo be without the Naivasha Children’s Shelter? There’s no way to know for sure, but I know what he would tell you. When he speaks of Daniel and the other staff members, his face lights up. He loves them so much and the feeling is mutual. That love, and the hope it inspires, is life-changing – for Jomo, Kamau, Martin and the countless boys who have come before them and will come after them. Hope is a powerful, powerful thing. Don’t ever lose it. If you want to know more or if you want to sponsor a boy like Jomo (or Jomo himself! He is available for sponsorship – he’s listed by his first name, Joseph, on the site), check out NCS’s website. If you’re unable to fully sponsor a boy ($100/month), there are options for partial sponsorship, purchasing school uniforms and carpentry toolboxes, and one-time and monthly donations of any amount. The day has finally arrived. Sixteen boys have been waiting (impatiently) for today. Our social workers spent 3 months on the streets getting to know the boys and preparing them for a new life, and finally the day has come for the boys to leave the streets. The social workers went to the streets early this morning, and gathered the boys. After saying goodbye to all of their friends on the streets, the boys got in a van, and began the journey to their new life. When they arrived at the Shelter, they were given a hot meal, clean clothes and a place to shower. They all received haircuts and medical care. Some of the boys were shocked to get their own bed--with a mattress and blanket! Many of these boys haven't slept on a bed in months, and for some it has been years. The boys then gathered with staff and other children at the Shelter to burn their old street clothes--a symbol of leaving behind their old life. All of these boys will need sponsors to help them change their lives. If you would like to sponsor one of these boys, and encourage them on their journey, please email us at NCShelter@gmail.com to find out which boys are available for sponsorship, or visit our website at http://shelteryetu.org/donate/ . $100 a month provides for a boy's complete care including housing, daily food, medical care, drug rehabilitation, sports, skills training, education, counseling, talent development, and outreach to his parents. You will receive a photo and biography of your sponsored child, and the opportunity to write him letters and get updates about his life. Thanks for partnering with us as we rescue these boys from the streets, restore their lives and then reunite them with their families! Fidel (far right) and his brother Emmanuel were reunited with their mother this month. Both boys will be beginning school in January. In March, we introduced you to nine-year-old Fidel. For two years, Fidel was sleeping on the streets. But in May, his life changed. A Shelter social worker came to the streets to rescue Fidel and ten of his friends. The boys were brought to Naivasha Children's Shelter where they were given clean clothes, a hot meal and their own beds to sleep in. A team of dedicated teachers and counselors helped the boys to overcome their addiction to drugs that they used in the streets, and begin re-learning important life skills. Earlier this month, we celebrated an important milestone in Fidel's journey. Fidel and his brother Emmanuel were reunited with their mother, Judith. Judith expressed her heartfelt gratitude to the Shelter family for rehabilitating her two sons and requested financial support since her husband, who was the sole provider in the family, has left her. The Shelter will help provide for Fidel and Emmanual's school fees while the mother trying to get on her feet. We are now working with Judith to begin her own business selling fish so that she can provide for her six children. Because of your support, seventeen families received Christmas miracles this month. Seventeen boys were reunited with their families and will be joining school in January. Thank you, and happy holidays from the whole Shelter family! The boys got a surprise visit from Santa before they went home for the holidays. Each boy received a sweater, a pair of pants, underwear, socks and new shoes for school. As your family gathers for the Thanksgiving holiday, we want to thank you for giving to Naivasha Children's Shelter. Because of your donations, we are able to rescue and rehabilitate children living on the streets and reunite them with their families. We are also able to help children return to school, and help families stay together. Albert, age 14, was rescued from the streets in April, and will be reunited with his family next month. He recently wrote a letter to express his thanks to Shelter sponsors. Hi all our sponsors. I send you many greetings like the stars. Hope that you are fine. I want to take this opportunity to say thank you for your support and caring. This is because you brought me from the street and due to your support, I am now clean. In the streets we had to sleep inside sacks, but now I have a good bed without bed bugs. And also in the street we had to beg for food, but now we are okay. And I want to take this golden chance to appreciate all of you for bringing me to the Shelter, where I am able to learn new things that I had not expected that I could. And with that few comments, may God bless you abundantly, and may you continue helping people in need. Thank you very much. The past months have been very busy at the Shelter. The boys who were rescued in May are continuing to progress well, and many of them will be returning to their families next month! We are already beginning work on the streets in order to rescue 20 boys next spring. We have five boys set to graduate from our carpentry program at the end of the year. These young men are currently doing an apprenticeship at local carpentry shops as they prepare for their government test. We have recently been able to hire an associate social worker, who will be able to help with follow up of boys we have already reintegrated. His primary role will be visiting children at home and at school to make sure they are doing well, and keeping a strong connection with the Shelter. We have also been able to make significant strides toward sustainability. This year, we were able to purchase 100 chickens, and some milking goats. A generous sponsor paid for a drip irrigation system (so we will be able to grow vegetables all year long!) and we also received catfish fingerlings for our pond. The Shelter is in desperate need of a new pick-up truck. The Shelter is 5 kilometers from town, and right now, we have to make many trips by motorbike to bring groceries to the Shelter, or waste hours walking into town for simple errands. A used pickup truck will cost us almost $15,000. Main Street Baptist Church in Alexandria, KY has generously offered to match any contributions toward the pick- up truck up to $7,500! We have already been able to raise $1,000, but please consider partnering with us for this major need. Earlier this year, we were able to purchase three goats (two females and one male) for milk at the Shelter. Unfortunately, our male goat died of disease earlier this month. The cost of a new male goat is $200. If you would like to help us purchase a goat, the boys have offered to name the goat after you! As the holiday season quickly approaches, don't forget that your shopping can benefit the children at Naivasha Children's Shelter. Click smile.amazon.com/ch/47-3206484 before you start your holiday shopping and Amazon will donate 0.5% of the price of eligible purchases to Naivasha Children Shelter! Stephen used to live on the streets of Naivasha, went through the Shelter rehabilitation program, and now is living at home with his grandmother and going to school. You can hear his story at our Dessert Reception on Sept. 20! It's that time of the year again--time for our annual dessert reception and fundraiser for the Shelter! Friends of Naivasha Children's Shelter is hosting our second annual dessert reception and fundraiser on Sept. 20 in Memphis, TN. The event will be at at 7 PM at the Great Hall and Conference Center, 1900 Germantown Road. This year, co-director Kristen Lowry will give updates on the Shelter's activities throughout the year, as well as share exciting plans for the future. You will also have the opportunity to give to the Shelter, or sponsor a child. We will have photos on hand of all the children available for sponsorship. Please join us for some great desserts and to learn more about how you can help save a child's life! You can RSVP on Facebook or by emailing us at nchshelter@gmail.com. If you're not in the Memphis area, now is still a great time to support the work of Naivasha Children's Shelter. Our work is supported by the generosity of individual donors. Our biggest needs are monthly sponsorships--both at the $30 a month level and at the $100 a month level. Please considering partnering with us with either a sponsorship, or a one-time gift. Your gift can make a huge difference in the life of a child. Friends of Naivasha Children’s Shelter is a registered 501c3 committed to furthering the mission of Naivasha Children’s Shelter. Update: Elvis is going to college! You did it! Thanks so much to everyone who shared and donated--Elvis can now begin buying school supplies and getting ready for his first year of college. Thank you so much for helping Elvis get to college. Shelter staff visited him last week to share the good news, and his family was overjoyed. Elvis wanted us to share this letter with you to let you know how much he appreciates your support. Thank you! Can you help us send Elvis to college? Elvis was living on the streets when he was rescued by Naivasha Children's Shelter in 2004. He lived at the Shelter for 10 years until social workers were able to reunite him with his mother in 2014. Last year, Elvis graduated from high school with a B minus -- a huge accomplishment! 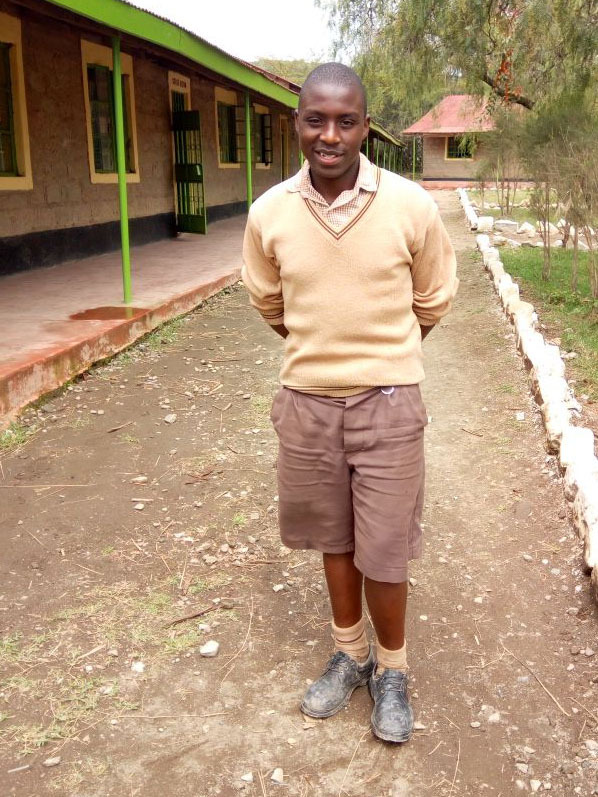 He recently got a letter inviting him to continue his studies with a Diploma in Electrical and Electronics at Kiambu Institute of Science and Technology. Elvis' mother is a single parent raising four children. She works as a casual laborer at a local flower farm, earning less than $70 a month. As much as she wants to, she can't afford to send Elvis to college. Elvis's total tuition for the first year of college is $1300. This opportunity will giveElvis a bright future, and help his whole family. We've started a GoFundMe campaign to raise the money Elvis needs to go to school. We are almost halfway to our goal, but we still need your help. School starts Sept. 6. Let's send Elvis to college!